One of the greatest hopes in the wake of the financial crisis was that there would be a surge in business investment, or capital expenditures (capex). The case for a capex boom was simple and clear: Equipment was getting old, and central banks were making it very cheap to finance this spending. But that story has been a flop. For the most part, American businesses figured out how to make do with the equipment they had, and they incredibly managed to squeeze out higher profit margins even as their equipment continued to get older. And as for that cheap money, there’s evidence that companies used at least some of it to finance share buybacks, thus boosting shareholder value through nothing but financial engineering. 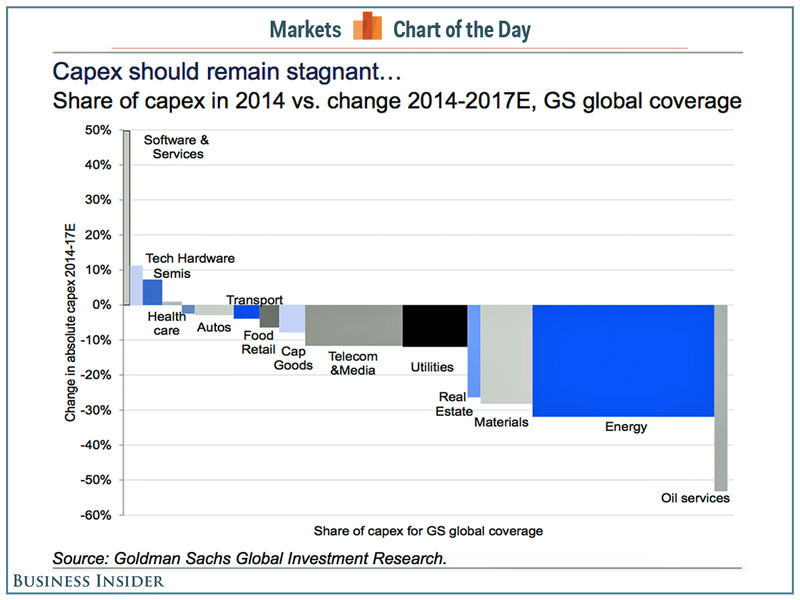 “Capex should remain stagnant,” Goldman Sachs’ Sumana Manohar, Hugo Scott-Gall, and Megha Chaturvedi wrote. To be clear, capex didn’t fall to zero. In fact, it continues to be the biggest use of corporate cash. After all, you need to maintain the equipment you’ve got. And to be fair to corporations, economic growth has been lackluster. And following the financial crisis, which caused financial strain for even the most financially robust companies, it’s understandable why executives and managers have been chickening out when it comes to investing in big growth projects. More recently, there was the crash in energy prices, and the energy industry accounts for the largest share of the capex spending that occurs in the US. “A steep 25% decline in Energy capex as a result of low oil prices combined with weak sales growth due to a stronger dollar led to an 8% decline in aggregate 2015 capex,” Goldman Sachs’ David Kostin said in a November note to clients. With energy prices remaining depressed and the dollar remaining strong, the risks appear tilted to the downside as far as capex spending is concerned. But Kostin and his team are arguably optimistic here. “We forecast Energy capex will drop by 20% in 2016 while S&P 500 capex excluding Energy will rise by 6%, resulting in overall S&P 500 capex growth of 1%,” he said. And so this discussion continues. Equipment continues to age while financing costs remain incredibly low. But global growth continues to be anemic, and oil has yet to find a bottom.